Reliance Home is the leading door supplier Malaysia. Established since 1999, Reliance Home has grown from just aluminum bifold door, to one of the largest door manufacturer of indoor door and outdoor door in Malaysia. We are growing fast and today, we produce a complete range of products, such as; Shower Screen, Indoor Door Range (Bifold door, Sliding Door, Swing Door), Outdoor Door Range (Folding Door, Sliding Door and Swing Door), Aluminium Windows, Glass wall, Skylight, Glass Railing, Balcony Glass, Staircase Glass, and other glassworks for both residential use and project purposes. Looking for products of house renovation Malaysia? Be it homeowners, contractors, and architectects, designers or custom builders who create their dreams — Reliance Home is the brand that delivers an unrivaled combination of workmanship, durability, artisanship and satisfactory experience. Founded in 1999, Reliance Home is growing fast and produce a complete range of house renovation malaysia products such as Shower Screen, Indoor Door Range (Bifold door, Sliding Door, Swing Door), Outdoor Door Range (Folding Door, Sliding Door and Swing Door), Aluminium Windows, Glass wall, Skylight, Glass Railing, Balcony Glass, Staircase Glass, and other glassworks for both residential use and project purposes. 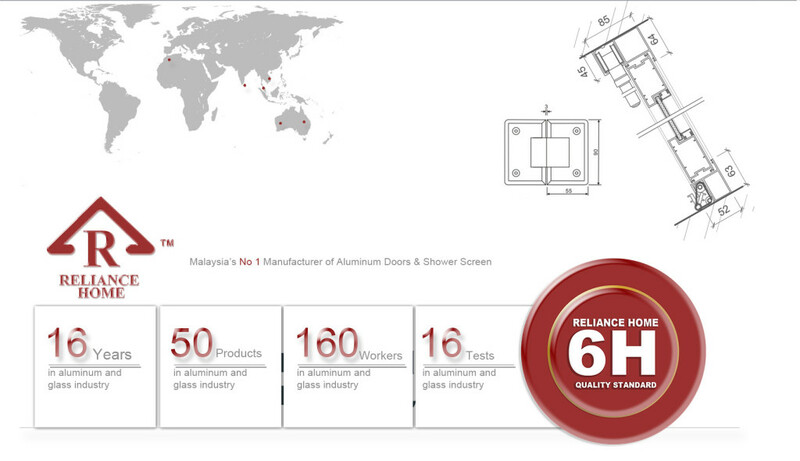 Reliance Home has been committed to manufacturing high quality, custom luxury house renovation Malaysia products such as aluminium doors and windows, proudly made in the Malaysia. Our dedication to high standards has made us a leader in both the modern style luxury home market and project. Reliance brand is a formidable force within the architecture industry; additionally consumer awareness is generated through securing consistency in Product Quality and Customer Service, controlled by ISO 9001: 2008 Quality Management System… All Reliance Doors come with two years warranty and after sales service. Our continued focus on minimalist, modern innovation keeps our house renovation malaysia products in the forefront of contemporary architecture and technology, while retaining the simplicity of low-maintenance. From our huge sliding door panels to folding doors, bathroom folding and swing door to kitchen/walk in wardrobe, hanging sliding door, huge window , two point locking system windows to balcony/staircase glass. We offer all these under one roof, of High Quality & at Competitive Price and do our utmost ability to fulfil your specific order!